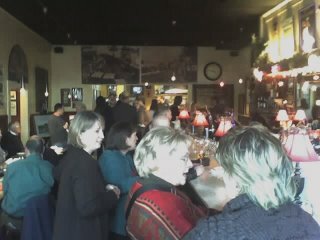 The Friends of Seaview held a raffle reception at The Depot restaurant. Charles Mulvey was a pretty famous watercolorist who lived in Seaview. My involvement was everything from press, to arranging location/hosting, wine pouring, designing, printing and sending out invitations, etc. 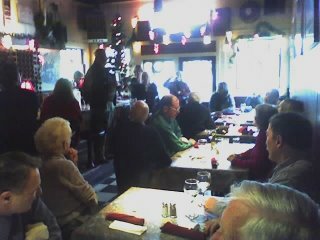 The event was very successful and many of us stayed for a Jazz Music Dinner of "Moules Mulvey" (steamed mussels). The community of Seaview is inviting the public to celebrate the memory of beloved Seaview artist, Charles Mulvey, and participate in this opportunity to acquire a beautiful and rare piece of original artwork. On Sunday, Dec. 3, at 3 p.m. there will be a reception and raffle drawing held at The Depot Restaurant in Seaview. Charles Mulvey, one of the finest watercolor artists in America, was a Seaview legend. He worked in the bright pink two-story beach cottage on 42nd Street named The Sea Chest and opened his gallery there in 1955. His larger canvas was the Seaview beach he loved. As he walked the dunes and beaches, dug clams, fished the surf and climbed the headlands he had known since childhood, he brought elements of understanding, sensitivity and pure love for his environment into his paintings. Most of his work was devoted to the vision before him, his beloved land, sea and community of Seaview. Charles Mulvey and his wife, Kaye, were devoted to the preservation of the character of Seaview. They were ambassadors of welcome and amazing art. Charles never lost the air of humility that he was just an average hometown guy who happened to paint pictures. Always gracious, Charles welcomed with open arms his friends, neighbors, community, visitors, tourists and families to share in the delight of his art and town.Mulvey paintings may be found in private collections across the nation. Charles Mulvey passed away Christmas Eve 2001. In honor of Charles and the Seaview community, Kaye Mulvey Cowen has generously donated from her private collection, a Charles Mulvey original watercolor of the dunes of Seaview. Another collector has donated a Mulvey limited edition print also of a beach theme. The two paintings will be raffled. You get two chances for the price of one $25 raffle ticket or buy five tickets for $100. The Depot Restaurant is hosting this opportunity to honor our Seaview legacy and acquire original art with a reception for the raffle drawing and complimentary wine and hors d'oeuvres on Dec. 3 from 3 p.m. to 4:30 p.m.